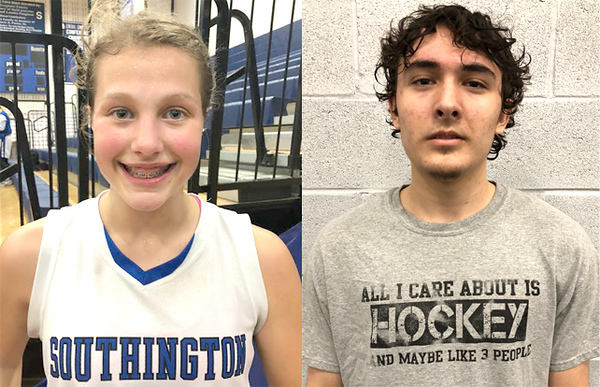 Southington’s Ali Carr and Newington’s Adam Belair have both contributed greatly in their respective team’s most recent wins, and have earned recognition as this week’s area Athlete of the Week picks as a result. The Southington girls basketball team rolled past E.O. Smith during the first round of the CCC Tournament Thursday evening. Carr, a freshman, scored a career-high 19 points, helping Southington move on to the next round. Carr has been side-by-side with Janette Wadolowski, as the two are the points leaders for the Blue Knights. Throughout the season, the Southington coaches have been stressing the fundamentals of the game and with Carr it’s all about finishing those layups. Southington lost during the second round of the CCC Tournament on Saturday afternoon, 69-51 to top-seeded RHAM. Southington will begin its run in the Class LL Tournament next Monday. Belair, the backup goaltender, was a major factor for the Newington-Berlin ice hockey team as it beat Hall-Southington 5-4 in overtime on Wednesday evening. Belair stopped 45 of 49 shots in the game. With the help of Belair, the Indians are currently on a four-game winning streak. And Newington-Berlin plans on keeping up its momentum as the season winds down, with five more games remaining in the regular season. “I think that is mostly because of the positivity that these guys have been bringing to the ice,” Belair said. Posted in New Britain Herald, Athletes of the Week, Newington, Southington on Monday, 19 February 2018 22:41. Updated: Monday, 19 February 2018 22:43.